Alphas... they're so fast and dangerous. The ones you get to fight in the demo gave a nice idea of how dangerous these enemies are going to be throughout the game. But, as time later showed, the learning curve for their behavior was a little steep for the non-Metroid expert. Right now I'm in the middle of a huge refactoring and rebalancing of every Metroid fight. Since each Metroid has customized variables (to determine how it will behave), I had to change each and every object's creation event, having to locate each room with a Metroid and tweak the code in the room editor. 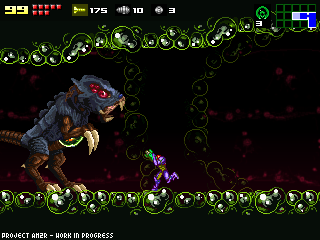 Now Metroids get their behavior via script, only providing their ID. This way I can visually change the way the agressiveness scales as the player advances in the game. Also, customizing behaviors for different difficulty levels is much easier now. Besides that, I also added more movement variety into the Alphas and Gammas. Now they don't chase you all the time, they give you a little rest, and in early fights, they even put themselves in vulnerable positions. Some Alphas just hit you and retreat while avoiding your missiles. All of this makes the flying Metroids a lot more diverse, and of course testing and balancing is necesary for each fight. Speaking of Alpha fights... The breeding grounds located in Area 2 were expanded a little bit. Fighting alphas in corridors works well enough, but doing so with Hi-Jump boots was a little tedious, hitting the ceiling on each jump. Now the rooms are taller, and battles are more "vertical" too. The music engine is finally working. I had to deal with some inconveniences, like having to do volume crossfades by hand (bass.dll did that automatically), and other minor workarounds. And last but not least. The way you acess the Map, and switch to the Equipment and Log screens changed. Instead of cycling through each screen, now an on-screen prompt apears. 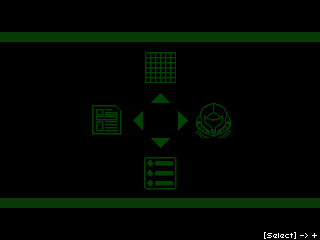 Pressing a specific direction lets you acess each screen, with the addition of an Options screen. Once I get that one working, you'll be able to customize the game options (and controller configuration) without exiting to the main menu. Yes, I know, the icons are a little minimalistic. But I think each option is pretty clear. That's most of the progress this month. Nothing that can be shown in good looking screenshots, but features and tweaks that make the game much more complete and balanced. By the way... the great people at Sepharos-Asks.net asked me for an interview. It was improvised, and my English is a little broken in some places, but it was a good experience. You can listen to it HERE. Sounds excellent. I love reading about the detail and thought you put into such things. everything is starting to piece itself together and it looks so polished!!! Followed this project for many years and very happy to see it nearing completion. Great job! I also want to add my appreciation of this project and am amazed that this labour of love (both your love and mine for what you are doing) still continues - I check this page constantly for updates. I use a Mac - and keep bootcamp around JUST FOR THIS GAME, seriously, this is an amazing thing you are doing here and I am definitely one of the many that look forward to it's completion. If I had one suggestion at this point (besides making it Mac compatible), it would be a more "animated" alpha hatching scene at least for the first one. But seriously even without it I am incredibly pleased and impressed with what you have done. Can't wait to open up this page and see "FINISHED!!" at the top. Good luck on the rest of the project. Honestly, I would love to see different difficultly settings, that they adapt for the advanced Metroid player, and for the new comers, the new way you are doing it. I think it could be a very interesting element to tweak the Metroids like that - adding nice layers to multiple difficulties (not just the usual less power, more damage taken we see so often). I loved the Alphas in the demo and while I could see some players points on them initially being hard (until you adapt to fighting them), I also felt there was a place for that higher difficulty. I think this can provide a nice balance for both types of players. Good luck and looking forward to the next update! Every update of this reboot is promising and rewarding to read, to say the least. I always thought it was admirable of you to so boldly take on this project, and how brave you must be to recreate the entire game by your own hands. It also takes time to see something like this through; an element that you seem to possess. It seems that you never intend to keep quiet, nor did you ever as of now. In terms of giving updates and information regarding your work of course. I would like to add that most developers such as yourself seem to lose their faith in their planned games, it always surprises me that you have not succumbed to a fate such as this. Cool Accent you got there!!! going through the Screw Attack blocks, and going to the final egg and all that? Or is the Screw Attack blocks in the upper-left of the landing site just for the demo, and they will be different for the actual release? I've been checking the page every day for a new update, so glad to see the project moving along. Keep going Doc, we're all behind you. The icons seem a bit obtuse. Perhaps they should have labels. Everytime I see an update, my heart skips. Keep it up. This is looking to be one of the best fan-games ever, if not the best. Great to see an update, enjoyed the interview also. Everytime i check for an update on your blog i get even more excited for this game, to say i cant wait for this is an understatement. Logbook and Options look like they could be confused for one another. Otherwise, I love this addition! I'm also loving this game so far. One problem: Will we see a Linux port sometime down the road? :? One more thing: What about a Linux port? Wine is increasingly having problems with AM2R demo. Every update gets me more excited for this. You're doing a wonderful job, and it's obvious that you really care about making this the best it can be. Keep up the amazing work. We're all cheering for you. I am always so excited to see you're still active. I have been following your project and I am anticipating its release. I have played your demos and am always impressed. Another update that is going back and changing things that were already done instead of making progress. I really think you should call what's done DONE and get the game pushed out. If tweaks need to be made later for people who need their hands held while gaming, then do them later. I just beat the am2r demo in 13 min with no items but bomb and spider ball. no ice beam, no missile tanks, no energy tanks, no charge beam, none of it. the gardian was really hard. and i got spider ball before i got bomb, cuz im really good at wall jumping. Nice, man! !It sounds really great.Congratulations for your job and God bless you! The Left and Bottom options look a bit too similar. I'm assuming one is supposed to be the logbook and the other is supposed to be options but I can't tell which is which. Maybe you could replace the options icon with the usual Spanner and Gear motif used in most games. hooray for the doc, i knew u wouldnt let us down, though i must admit i was worried with the post being so late. good to see you are still working on this game. hope life is treating you well doc and that your family is good.. Hearing that you worked on the room design and AI for the Metroid fights is very exciting news. The game being more accessible to more varieties of Metroid fans will definitely help the spreading of its knowledge. Interesting. I like that idea, Keep working on it your doing great. I am so excited for the final release. Wow, just wow, glad to hear you're back on track and working reaaally hard too. The new updates look amazing, I bet you must already be tired to read this buuut i can't wait for the finnished game. That'll show those at Nintendo how to make a cool Metroid game and how dramatic monologues (if it's spelled wrong, grammar nazis, don't EAT me) don't really make a game more fun, they MAY make it epic but not more fun. Keep it up doc you can do it. Ah, one more thing, the game feels ever closer but, think you can please give us a hint on just how close it actually is? Like in previous updates, show us what's done, what's not and how much more needs to be done. If it's not too much of a bother. So, each battle will be different? Best to have some sort of incrementer for every time Samus fights a new Metroid. That way Samus could face any Metroid and they get progressively tougher, no matter what order she faces them. This project is coming along well. Ich bin begeistert!! I'm just so exited for this! It's great to know that work is progressing and these new features just add more to it. I really appreciate your effort and dedication to this project! Es bueno ver que pones tanta dedicación a los pequeños detalles, eso es lo que hace la diferencia entre un trabajo bueno y lo tuyo, un trabajo admirable. Hey doctorm64 thank you very much for all the work. But i have a question, I tried using headphones and on both confrentation and am2r demo but only the sound effects went to the headphones while music still went through to the cpu speakers. I tried to fix that with cpu setings but nothing worked. i also tried the game options but every result was the same, I would appreciate it if you could look into it and see if its the game or what, I tried multiple pairs of headphones, but all were the same, and all the other things like other games and my sisters online thingy. works perfectly, just the am2r stuff. So please just check cuz I like using headphones so I dont disturb others. Sorry for the inconvenience, but thanks. And cpu means computer. Looks great, but I'm sorry to say that no, the icons are not clear at all. The top one looks like an Excel spreadsheet. The left one looks like the generic Windows "file" icon, or maybe a Word document. The bottom one... I have no idea. The right one is explicit on what it is, but not on what it does. I hope you will eventually finish this game, and I'm sure it will be awesome (and I hope it will not be taken down too fast by Nintendo), but these icons are less than optimal. I read a whole bunch of this blogs, and i want to say that the alpha music for the demo is great, i would say use that same thing for the alphas, make a slower and creepy version for the gammas, try to see if you can make a song like the one in the music trailer for zetas, and for omegas, do as you said a new song, and a remix of the queen theme. Ok I figured out what the problem was with the headphones, so never mind. hey doc, thenks for making the game, i told all my freinds, they dont care, but its cuz they dont like metroid, metroids my #1 thing so i reeaaaaallllyyy look forward to am2r, though, i think maybe you should call it like, Metroid(am2r: The Hunter Returns.or somthing like that. make it simular to return of samus, but not that name. THIS. GAME. IS. AWESOME. I literally CANNOT wait for this game to be completed. Only the first two areas! I NEED MORE!!! I'd say make it available quick before Nintendo cracks down. I don't know why game companies wait until you nearly finish a project like this, show how awesome it is, then they step in and send a cease and desist. Good luck, though. Maybe they'll be tolerant about it. I like the idea of the menu, but does the menu button take you to that selection screen? Metroidvanias need to be able to pull the map up with a single button, so I hope that selection screen only comes up when you want to change screens from the already-open menu. I think you should, I know i speak late but beter late than never. I think you should Defenitley put fusion bosses in am2r. just becouse most enemies came from sr388. you might could put serris after gravity suit and make it to where to kill him you had to shinespark him a bunch. and aracnus is already in there, you could make nettori (the plant that gives you plasma beam) at the weapons tower and make him guard plasma beam. And you could make there be a seperate room before space jump and Yakuza could be in the room before space jump. And Nighmare was built by galactic fed. but I would like it if you put him in there becouse I think he is a great boss that got unused. He is great and he could just be in there. Please if you can just add these in there. Hello there, I have been following your progress throughout the years and your project is going at a slow pace, so I should give you a suggestion as a former solo/indie game developer/remaker. If you don't allow this project to become a teamproject (open-sourced), it is going to eventually get into development hell. Compare how fair you used to develop it and how slow it is going right now, I attribute this to life-change, you had a lot of free time in the past, but right now you have to dedicate this free time on something else (family, friends, self entertainment), so if I were you I'd create a facebook page, a page in sourceforge and recruit people who would voluntarily support and complete your project. Or else you are going to meet the list of several solo remakes which were left abandoned after the 5th year of its maintenance. I'm very happy to sit down and read the progression so far. Please do an awesome job! Based on what I've seen so far, I would GLADLY purchase this game for a full-game price! I'm very happy to sit down and read this progression. Please, OWN your project! :D I'd gladly buy this game for full price in a heartbeat! I've been following this for a year now, its looking fantastic. I liked the Demo, I can't wait for more! Wonderful job. I've been reading this website for the past 2 years. Well, my only suggestion is to make animations. One when Samus receives information about the last Metroid hive and lands on SR388; one when she gets surprised to see a standard metroid evolving, revealing that they can be more powerful than her early experiences had already shown; a few commentaries of Samus about the chozo ruins, labs and breeding rooms; Samus feeling a little cold after hearing the Queen's roars (close to the Queen's room); the Queen appearing; the Queen dying; the last baby hatching and Samus leaving with it and commenting that maybe the space scients know what to do with it. Well, these are not a few, these are many, but the game would seem so much cooler and more modern with them... Think about it. mister ricardo you cant just hint to take one some one elses digital baby. I'm gonna die before I play this game. I've been following for years now and it seems like I'm going to be following for years to come. I'm just gonna hibernate for a while. Wake me up when/if it's ever finished. You should add a short laser sight to Samus' arm cannon. It wouldn't strech very far, juts a few tiles, but it would be slightly easier to tell where you were aiming. Also, when a missile is aimed at an angle and hits an indestuctable block, it should bounce a bit, allowing for some tactical manuevers (forcing it to ricochet to hit enemies around corners). Last, but not least, you should make enemy spawn points, enemy health, enemy attack strength, and most importantly; enemy behavior all randomized, but still tuned to the performance of the player. On lower difficulty settings or when you're not doing very well, the game should make itself easier, and if you're on a higher difficulty setting or if you're doing very well, the game should make itself harder. If all goes well, you can make it happen with just a week's worth of code, and it will probably effeect the entire game. I hate to rush you but i would like the game to be finished soon. i had a bad dream that you got in a car crash and died, and nothing got finished... i was really depressed when i woke up untill i relized it was a dream and checked the blog to see if the report of the crash was there and it wasint so i figured it was a dream. i really dont want that to happen and plus i want to download it before nintindo takesw it down or something. This just looks better and better but. One small thing, since a lot of people pointed out that samus looked odd in the demo, i haven't found this question yet: Are you aiming for the Other M power suit? It's just that that thing looks nice and all in 3D but on a side scroll platformer... I don't know, all those smooth surfaces would be lost in the pixel world. But who knows maybe you can do it. If you ARE going for the Other M power suit, then be carefull with propotions. Samus' leg doubles clearly when aiming diagonally. To anyone saying you would buy it. That would be illegal for him to do. He can not sell, this. As it being a remake of a Metroid Game, which being copyrighted, if he was to make money off of it, he would be infringing the rights. So, since he knows that he doesn't ask for any money to work on this, nor will he likely charge or make a fee for us to play this game. If it wasn't for that, many of us likely would be paying to help further the ability of making it. I am not sure how the others get shut down, but maybe it involves something with them earning money from it. Who knows. Can't wait to see the next update. Hopefully you took the idea, of having two settings, Self-learning Metroids, or normal Metroids. For the Adaptable, Long time Metroid game player. Comparatively to the new comer.